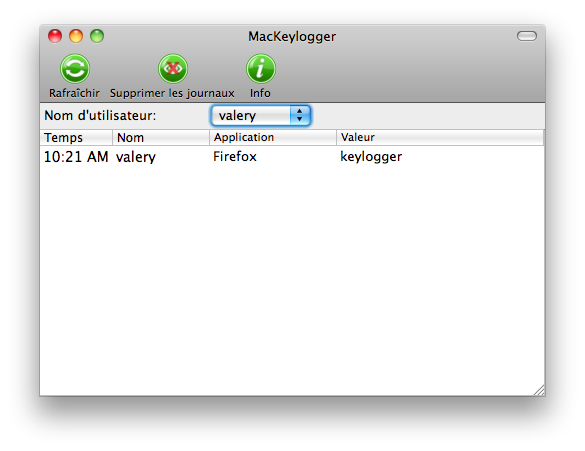 Small, simple and functional, Mac Keylogger monitors and records keystrokes on your Mac. Easy to install and run, Mac Keylogger works on Mac OS X v. 10.6 and above. Best of all, Mac Keylogger runs in the background - invisible to most users. Keystroke logging works in any language your computer supports and captures text typed in any application or web page except passwords. That makes Mac Keylogger a great monitoring tool for parents who want to keep tabs on the messages their kids send. See HeavenWard's articles about children and internet dangers. Mac Keylogger is Mac OS X keylogging made easy! Top 4 Download periodically updates software information of Keylogger pour Mac 4.16.41 full version from the publisher, but some information may be slightly out-of-date. Using warez version, crack, warez passwords, patches, serial numbers, registration codes, key generator, pirate key, keymaker or keygen for Keylogger pour Mac 4.16.41 license key is illegal and prevent future development of Keylogger pour Mac 4.16.41. Download links are directly from our mirrors or publisher's website, Keylogger pour Mac 4.16.41 torrent files or shared files from free file sharing and free upload services, including Rapidshare, HellShare, HotFile, FileServe, MegaUpload, YouSendIt, SendSpace, DepositFiles, Letitbit, MailBigFile, DropSend, MediaMax, LeapFile, zUpload, MyOtherDrive, DivShare or MediaFire, are not allowed! Your computer will be at risk getting infected with spyware, adware, viruses, worms, trojan horses, dialers, etc while you are searching and browsing these illegal sites which distribute a so called keygen, key generator, pirate key, serial number, warez full version or crack for Keylogger pour Mac 4.16.41 download. These infections might corrupt your computer installation or breach your privacy. A keygen or key generator might contain a trojan horse opening a backdoor on your computer. Hackers can use this backdoor to take control of your computer, copy data from your computer or to use your computer to distribute viruses and spam to other people.